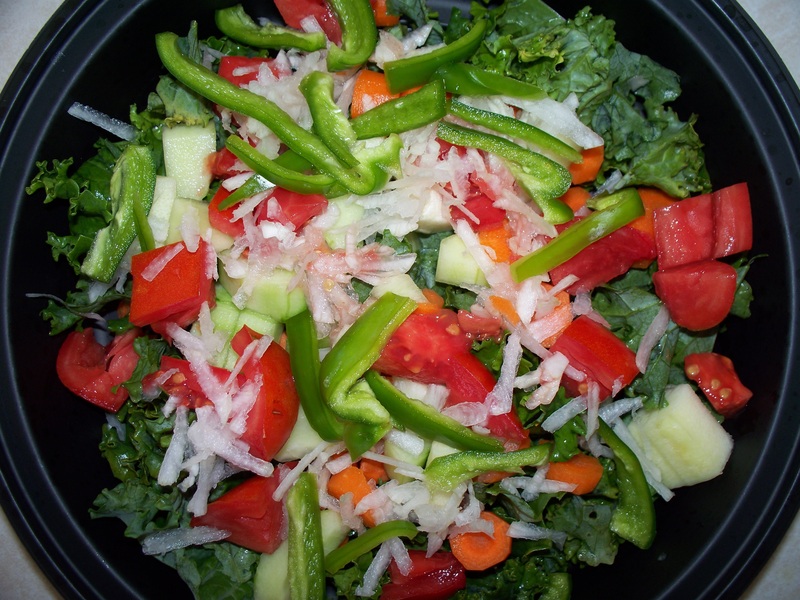 Ingredients for this kale salad were grown within 100 feet of our kitchen. It is as local as food gets. We enjoy garden produce in high summer — when nature’s bounty yields so much food we either preserve or give it away. Any more our household gives away more than it preserves because the pantry is well stocked with previous years’ harvests. Friends and family talk about the “local food movement.” In Iowa it is being assimilated into lifestyles that gladly incorporate ingredients from all over the globe. This assimilation has taken the local out of local food. From an intellectual standpoint, it wouldn’t be hard to replace food grown in China, Mexico, California and Florida with crops grown here in Iowa. The number of acres required is surprisingly small. For example, local farmer Paul Rasch once estimated it would take about 110 acres to keep a county of 160,000 people in apples all year. The political will to encourage home-grown solutions in the food supply chain doesn’t currently exist. Until it does, rational, local solutions to food supply remain in the ether of unrealized ideas. A vendor at the Iowa City Farmers Market was recently suspended for violating a rule that produce sold there must be grown by the vendor. Just walk the market and ask booth workers from where they hail. Often he/she is an employee or contractor working for a farm seeking coverage around many Eastern Iowa farmers markets. Too often they are anything but local growers. What’s been lost in this commercialization of local food is the face of the farmer. Knowing where one’s food comes from is a basic tenant of the local foods movement. I enjoy working with local growers on a small acreage to produce food for families. At the same time, I seldom purchase a box of cereal from the supermarket even though I’ve seen the grain trucks queue up to unload at the cereal mills in Cedar Rapids. For example, my garden doesn’t produce enough garlic for the year. I’d rather buy a supplemental bag of peeled garlic cloves produced at Christopher Ranch in Gilroy, Calif. than cloves lacking discernible origin at a farmers market. I know how Christopher Ranch produces their garlic. Absent the face of the farmer, there is value in understanding food origins, and that means some percentage of a household’s food supply will not be local. There is a lot of marketing hype around “organic,” “GMO-free,” and “gluten free” foods, and this has to be impacting the customer base of local food producers. If consumers feel they can get a reasonably priced, “healthy option” at the supermarket, why make an extra trip to the farmers market, except for the occasional special experience? Why wouldn’t one pick up a bag of Earthbound Farms organic carrots when local growers can never produce enough to meet demand? At the same time, marketing hype is just what the name suggests. Food security and sustainability are complicated. Before the local foods movement came into its own, it already is being assimilated faster than one can say snap peas. From a consumer standpoint the local came out of local foods some time ago, and it may not be back. This entry was posted in Local Food and tagged cooking, environment, homelife, kale, local food, sustainability. Bookmark the permalink.